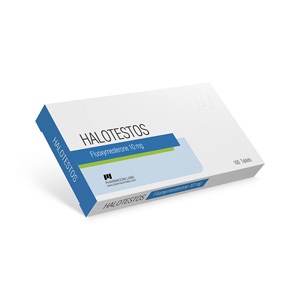 Halotestos 10 mg is a tableted steroid of the anabolic group, characterized by active androgenic and moderate anabolic activity. The basis of this drug from Moldovan pharmaceutical company Pharmacom Labs is the active chemical Fluoxymesterone. This anabolic steroid has become very common among powerlifters and weightlifters due to the fact that it affects the increase in strength, muscle density and aggression, without an increase in total body weight. Thus, the athlete has no risk of an undesirable increase in weight category. The drug is also popular with bodybuilders as a good tool during the period of preparation for a competition, because thanks to it the muscles look more massive with a constant diameter. However, taking Halotest, should not forget about its high toxicity to the liver. When using the drug for more than 4 weeks, a very strong negative effect on the liver is expected. The dose for receiving Halotestos 10 should be calculated individually, taking into account the goals pursued by the athlete. So for bodybuilders, the recommended dosage of the drug is 20-30 mg daily, and for powerlifters, this dosage is increased to 40 mg. This sports pharmacology drug is recommended to be taken in the morning and in the evening, dividing the pill into two parts and washing it down with plenty of liquid. Halotestos steroid can be taken during meals. Bodybuilding athletes quite often add other steroids to the course of Halotestos 10. For example, a combination of Halotest 30 mg every day + Equipoise 700mg every 2 days for 4 weeks will show a remarkable effect in the form of better and more dense muscles.